ROSE BARRACKS, Germany - Sniper Leader Course, Operation Lone Wolf, a three-week sniper training took place from March 14-31, 2017 on Grafenwöhr Training Area and Rose Barracks. 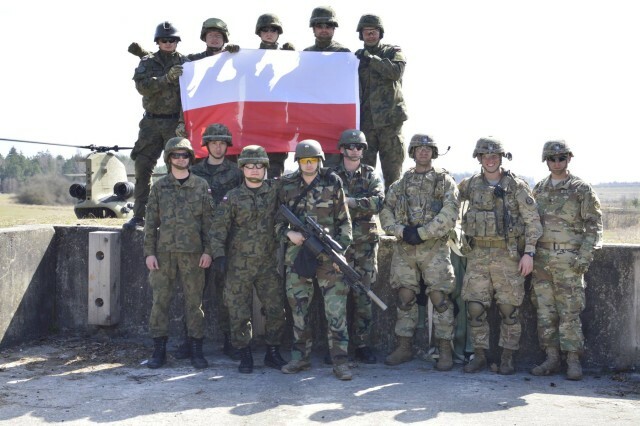 The course, designed to train and test snipers from across the 2d Cavalry Regiment, allowed Soldiers the opportunity to share tactics and techniques between Squadrons and their European Allies. During the event, Snipers underwent a week of classroom activities covering ballistics, communications systems, hide sites progressing to a week of field exercises where snipers trained on building urban and forested hide sites, infiltration techniques and conducted calls for fire missions from mortar assets. A part of the final week, snipers conducted field team engagements, pistol training and a familiarization fire from helicopters. The collaborative course was facilitated by 2CR, 3rd Squadron's Sniper Squad led by Staff Sgt. Ryon Carrillo, sniper squad leader. Focusing on teambuilding, highlights of the first weeks training on field expedient antenna included U.S. Snipers providing instruction to Dutch and Polish Snipers on how to extend the range of their communications equipment by 3-4 times by building wire antennas out of spooled wire, insulators, resistors, and antenna port connectors. These skills were new concepts for the foreign snipers and helped to validate tactics, techniques and procedures, or TTPs, for U.S. snipers. 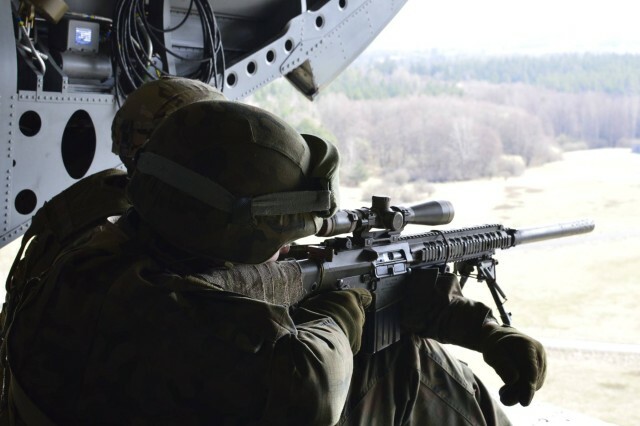 This skill is particularly important for snipers because they often operate forward of the main battle area and out of communications and supporting range of the unit's main body. The second week of the course focused on field craft, which included an infiltration stalk lane requiring sniper teams to move undetected through five kilometers of terrain occupied by an oppositional force, or OPFOR, and engage an enemy observation post. After successfully destroying the enemy observation post, snipers were required to establish a hide site with good observation on the enemy area of operation and call for fire from mortar assets. After successfully disrupting enemy armor formations with indirect fires, the snipers then requested to break down from their hide site and conduct an exfiltration. 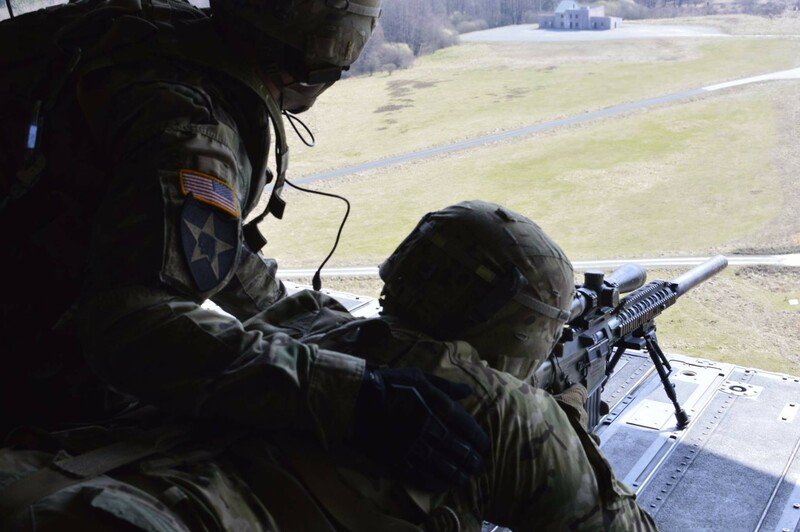 During the mission, U.S. Snipers worked within the same teams as the Dutch and Polish in order to could share TTP's and expertise in the accomplishment of the mission. The day long stalk tested both sniper's mission sets--to deliver long-range precision fire on key selected targets or targets of opportunity and secondarily to collect and report battlefield information. The highlight of the third week was the aerial shoot from a helicopter, focusing on high angle shooting. Together with U.S. air assets, sniper teams loaded into a CH-47 Chinook and conducted engagements from various elevations and at distances up to 1,100 meters on an unstable aerial platform.